Built as a bank and subsequently used as the city’s High Court, the Glasgow Ship Bank’s 1884 building has a long and distinguished history. 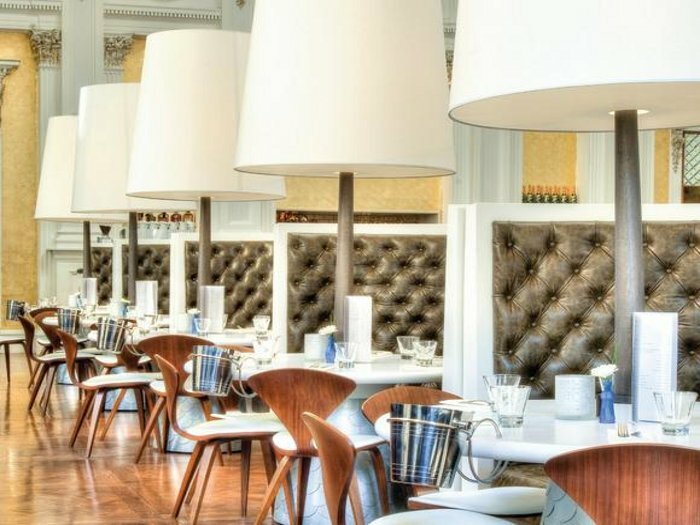 It is now the Corinthian Club, a four-floor ‘pleasure palace’ comprising bars, restaurants and a casino, which recently reopened after a refurbishment by local design practice Graven Images. Instead of focusing on its courthouse past, Hamilton and his design team went back to its roots as a bank. 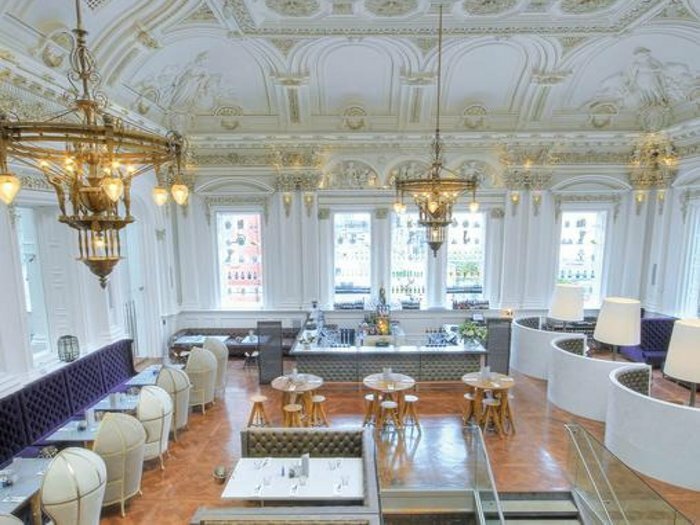 The Bootleg bar, for example, which used to be the banking hall, has a bar made from old safes, and a mosaic floor by Scottish artist Nichol Wheatley made from more than half a million tiles with a design based on Scottish banknotes. Loose furniture here is an eclectic mix of chairs and tables by Graham and Greene, Pols Potten and One World. 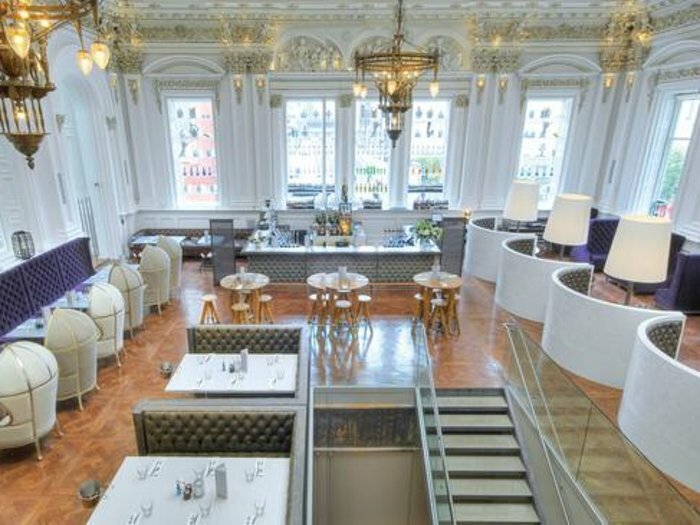 The grandest space in the Corinthian Club is the Tellers Bar & Brasserie, which has a 7.5m-high glass dome. 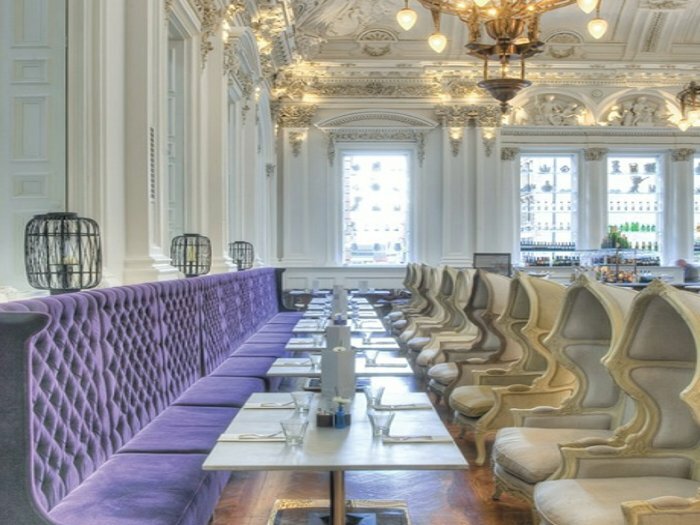 A previous scheme had not lived up to its potential, so Graven Images added some glamour with original French porter chairs, padded banquettes upholstered in purple, and zinc tables. There are two bars to be found here: one finished in cut-glass mirror tiles and topped with crackle-glazed lava stone; the other with an unusual front which looks like it is upholstered but has actually been made by casting padded leather in concrete. ‘It was a bespoke product from a Glasgow-based company called Gray Concrete,’ Hamilton explains. ‘We had seen a small sample of fabric cast in concrete, and we thought it would work really well with padded upholstery.’ Gray Concrete also created a full concrete sofa for outdoors, which looks so realistic that customers have occasionally sat down a little too hard on it. ‘They’ve had to put a sign up to warn people. In Glasgow, even the sofas are hard, jokes Hamilton. The chandeliers here are reproductions of the ones originally used in the bank, and made by the same Bristol company. Surface specialist Rearo supplied specially designed curved booths in white Corian for the Tellers Bar. Hand-cut and shaped they are accompanied by bespoke tables designed by Graven Images with zinc bases and white Corian tabletops, oversized standard lamps –also designed by Graven Images – and classic wooden Cherner Chairs, a product originally designed by Norman Cherner in the Fifties and recently reissued. For example the Boutique bar on the ground floor has a cut-glass mirror-tiled ceiling and is lit by art deco chandeliers supplied by Du Bote Du Monde. To catch the attention of passers-by Graven Images placed by the windows cut-glass mirrors with a pattern loosely based on some of the building’s original decorative features. A 5m-long glass and steel table designed by Graven Images and made by EK Metals and Glassage dominates the space, but this can be relocated as the room is sometimes used to stage fashion shows or pop-up shops. ‘A wall of LCD screens opposite the windows is a deliberate move to grab people’s attention with moving light and imagery, as well as acting as a large screen for fashion shows and product advertisement,’ says Hamilton. The Boutique bar has a surround decorated with a thousand exquisitely crafted acanthus leaves, hand-moulded in plaster by Glasgow company Halcyon.